Nila takes pride in being one of the founding members of the Rangerettes and member for 43 years. She reminds us that, "You don't become a great cowgirl by yourself. We're a team set in motion to achieve a common goal." 1 of the mother daughter duos winning a national championship with her daughter last year. She is married and has a small farm and she is a dental assistant and her drill partner for the last 2 years has been Cadillac. Michelle started riding with team in 2009, she has enjoyed winning National Championships with both of her daughters. Her drill partner is Sooner. Tavia started drill in 2008. She is married and lives in Bridge Creek, OK. Other activities she enjoys are trail riding and camping with friends and family, playing indoor soccer, and being involved and active with our church youth program. Her drill partner is Zee. Megan started on the team in 2004. She lives in Mustang, Ok. She graduated OSU-OKC in 2015 with an Associates in Healthcare Administration. Zeus has been her drill partner since 2012. She has been riding with the Rangerettes since 2008. Her partner in drill is Brother. Kelly joined the team in 2017. Started on the team in 2009. Her drill partner is Pebbles. She is 17 years old and will be a senior at Blanchard High School. Her drill partner for the second year is Rookie a 6 year old quarter horse she broke and trained herself. She is in the equine program at MidAmerica Votech and after high school she would like to continue training horses and working in the equine industry. 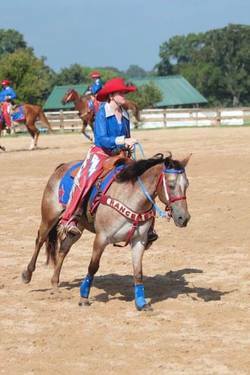 Elizabeth started on the team in 2003 and is from Mustang, OK. She has endured broken bones and rowdy horses to keep the spirit of equestrian drill alive. Her drill partner is Fury. ​Joined in 2016, her drill partner is Molly. Sheridan attends Noble High School where she will graduate in 2017. She is in FFA and enjoys showing pigs. Her drill partner is Penny. When Sheridan graduates she plans on attending the University of Oklahoma. She joined the team in 2015.